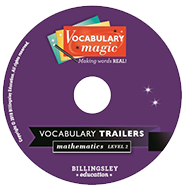 Each elementary "bundle" includes materials for 24 students working in groups of three (8 copies each of the 20 card sorts), 1 DVD with 20 vocabulary trailers and 20 PowerPoint (PDF) presentations, student instruction page, pack & storage zip-lock bags, plus a teacher guidebook - 6 Steps to Building Academic Vocabulary - Using Card Sorts & Vocabulary Trailers in the Classroom. 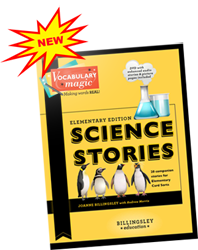 Now, each elementary science card sort activity can be followed with a companion story. 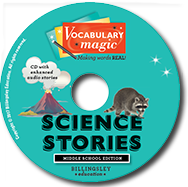 Our science stories weave science content and newly introduced words into a fun tale that students will love to hear and read. Instructions include engaging note-taking strategies and special tools to support Ells and struggling readers. 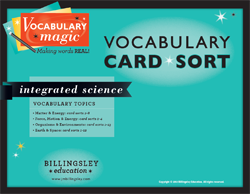 This 32 page guide provides a Spanish translation for all 20 card sort activities (180 terms and definitions) A perfect resource for beginning English speakers! Click here for a peek inside the toolkit. 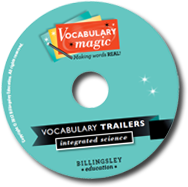 Each middle school "bundle" includes materials for 15 students working in groups of three (5 copies each of the 37 card sorts), 1 DVD with 37 vocabulary trailers and 37 PowerPoint (PDF) presentations, student instruction page, pack & storage zip-lock bags, plus a teacher guidebook - 6 Steps to Building Academic Vocabulary - Using Card Sorts & Vocabulary Trailers in the Classroom. 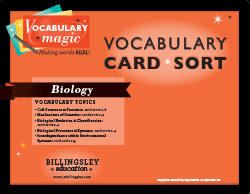 This 40 page guide provides a Spanish translation for all 37 card sort activities (333 terms and definitions) A perfect resource for beginning English speakers! 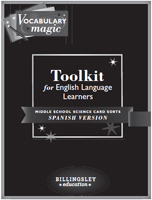 Click here for a peek inside the toolkit. 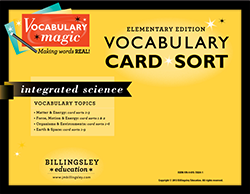 Each high school "bundle" includes materials for 24 students working in groups of three (8 copies each of the 21 card sorts), 1 DVD with 21 Vocabulary Trailers, 21 card sort PowerPoint (PDF) presentations, student instruction page, pack & storage zip-lock bags , plus a teacher guidebook - 6 Steps to Building Academic Vocabulary - Using Card Sorts & Vocabulary Trailers in the Classroom. 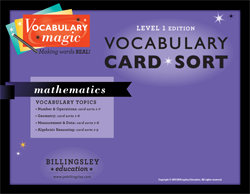 Each Math Level 1 "bundle" includes materials for 21 students working in groups of three (7 copies each of the 26 card sorts), 1 DVD with 26 vocabulary trailers and 26 PowerPoint (PDF) presentations, student instruction page, pack & storage zip-lock bags, plus a teacher guidebook - 6 Steps to Building Academic Vocabulary - Using Card Sorts & Vocabulary Trailers in the Classroom. 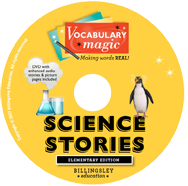 Each set includes 8 sentence stem strips with a metal book ring. A great tool to ensure students are speaking and writing in complete sentences! 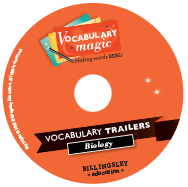 Learn how to tap into the power of imagery, communication, and collaboration to make vocabulary building fun and meaningful! 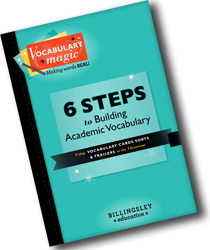 Research has proven that students with a larger, more nuanced vocabulary become more proficient readers, writers, critical thinkers, and learners, making them more likely to succeed in academic environments. 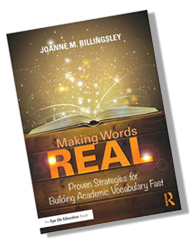 In this new book from Joanne M. Billingsley, an award-winning teacher and educational consultant, you will discover how to help your K-12 students expand their academic vocabulary across the content areas. 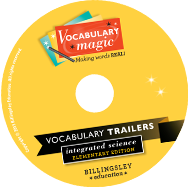 The book also features sample teacher-to-student dialogues to demonstrate how to talk about words, as well as games and activities that motivate students and help word meanings stick. 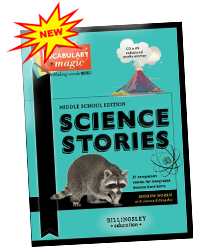 No matter what subject area you teach, your students will benefit from the exciting and powerful strategies in this book. Teacher Guidebook (40 pages) includes: research, implementation tips, 24 games & extension activities for students, tips for ELLs, sentence stems and much more!